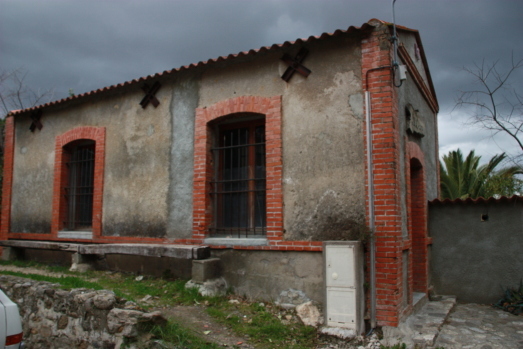 The commune of Laroque was one of the first to be equipped with both public and private electric lighting. The hydro-electric generating station operated from 1898 to 1923. As it was difficult to move around at night in the unlit roads, the municipality considered it a good idea to have electricity installed in the village. At that time lighting was provided by candles or paraffin lamps and only very few communities had electricity. The electric light bulb had only been invented in 1879. So the introduction of the electricity generating station was a prodigious project. For its inauguration in 1898, all the neighbouring villagers came to see this new invention and to try and understand how it worked. It was said that someone from a neighbouring village came with a barrel, believing that he could take away some electricity and then bottle it. This ancient factory was able to produce electricity due to the power of the water flowing down a cast iron pipe from a reservoir 300 metres away, above the factory. It had to be opened manually every time it was needed. After the factory was closed, the village children used the reservoir as a swimming pool and then as it dried up, it became a meeting place for ‘boules’. The building was then used by the hunters and you can still see the benches used for cutting up the game.